(Bend,OR) – The Pacific Crest Trail provides a vibrant thread for hikers and horseback riders through Washington, Oregon, and California. Crux Fermentation Project’s beer is distributed in all three states (as well as in parts of Idaho and Colorado). 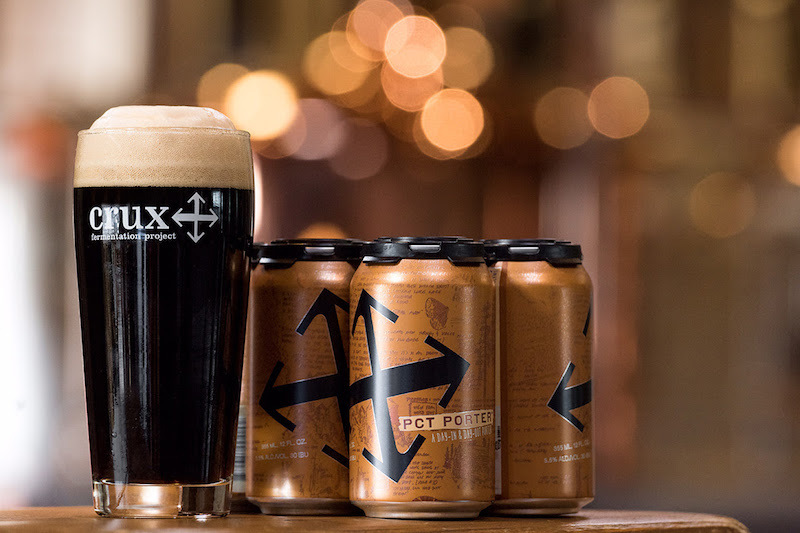 Crux’s hometown of Bend, Oregon, is a favorite of PCT hikers who come to enjoy the Cascade views and a refreshing beer and to share stories from the trail with newfound friends. The more PCT travelers we’ve met at our tasting room and the more stories we’ve heard, the more we’ve understood the trail’s significance and felt a greater need to support it. It’s an important historic asset to our friends and community. We wanted to celebrate the Pacific Crest Trail in a very real, authentic and human way. We wanted the imagery to convey the human experience of the trail so that those who would eventually enjoy this beer could gain a little bit of a deeper appreciation for the trail itself. We conducted online research for PCT hiker blogs and journal entries looking for examples that went beyond words to include illustrations that captured their experience. It didn’t take long to discover thehikeguy.com and our very own local PCT enthusiast, Kolby Kirk. We immediately fell in love with the stories (both verbal and visual) that the pages of his journal shared. It turns out that Kolby was a fan of Crux and loved the idea of celebrating the trail experience in a collaborative way with us. Crux Fermentation Project is proud to sponsor the Pacific Crest Trail Association’s effort to care for and protect the trail. Crux Fermentation Project is brewer-owned and operated. We’ve designed our brewery to allow for non-traditional brewing methods like decoction mashing, open fermentation, oak barrel aging, wild yeast strains and experimental hops. All Crux beer is bottled and labeled (and now canned) in small batches right at the brewery. More at www.cruxfermentation.com.